11th Annual Sustainable Santa Monica Student Poster Contest! The Poster Contest is open to all K-12 students who attend school and/or live in Santa Monica. Each year, students use art to investigate a theme of sustainability relevant to Santa Monica. 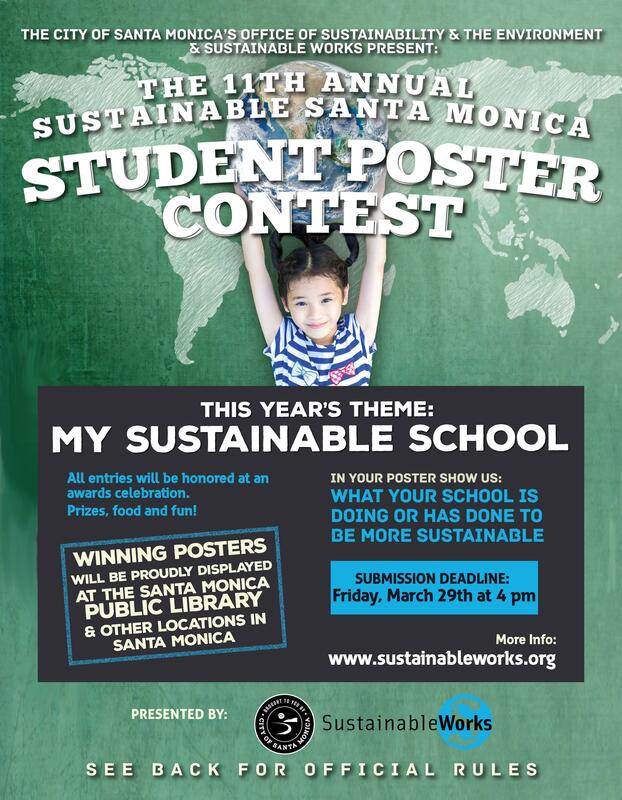 Sustainable Works, along with the City of Santa Monica’s Office of Sustainability and the Environment is excited to announce the 11th Annual Sustainable Santa Monica Student Poster Contest! The Poster Contest is open to all K-12 students who attend school and/or live in Santa Monica. Each year, students use art to investigate a theme of sustainability relevant to Santa Monica. This year’s theme is My Sustainable School. Sustainable Works is scheduling 20-minute presentations to share the principles of sustainability in Santa Monica as it relates to this year's theme. Attached is a flyer with the contest rules, selection process, and information on submitting posters. To help us continue to grow this wonderful event, we welcome your help in spreading the word to your school and encouraging participation! When the community promotes the contest, students participate. Last year over 730 students participated in the contest and this year we’re looking forward to even more. Prizes for winning posters include $10 - $100 gift cards. The winning posters will be displayed in the of City of Santa Monica, helping to further showcase our budding young artists while raising awareness of the importance of both education and a sustainable learning environment in developing environmentally conscious citizens and healing the planet. May 22nd: Contest awards ceremony and celebration to honor student winners and all participants. Gifts and prize drawings for all!